Municipal Service commission of West Bengal has release thair notice for 149 Sub Overseer Post. And also Municipal Service Commission has provider MSCWB Syllabus 2017 On official Portal. The candidates who are searching for MSCWB Exam Syllabus, Exam Partten, and Previous Question paper, here is the best place for you. 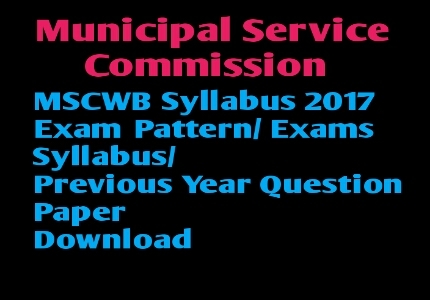 Here you can Know about the MSCWB Exams pattern, syllabus and aslo download the previous years question paper just on click and free of cost. Subject : General Knowledge, Mathematics, General English, Other General Subjects.